Bath time is actually pretty popular around our house. Carrigan loves it. Justin is in charge of it. That makes me pretty happy. I love catching them in special moments together during their bath routine. They have some of the sweetest conversations! Yes, sometimes I stand outside the bathroom and listen in. It makes me love them both even more than I already do. We love sharing what works for our family in hopes that it might work for yours too! Sponsored Post: This post is sponsored by Baby Dove but the content and opinions expressed here are my own. I think we’re pretty lucky that Carrigan is a huge fan of bath time. I can still remember when Weston was between eighteen months and two years old. He went through a phase where it was nearly impossible to bathe him. We tried everything we could possibly think of to come up with a bath time routine that worked for him. Thankfully it was just one of those toddler phases and he eventually got back to wanting to be part of bathing again! 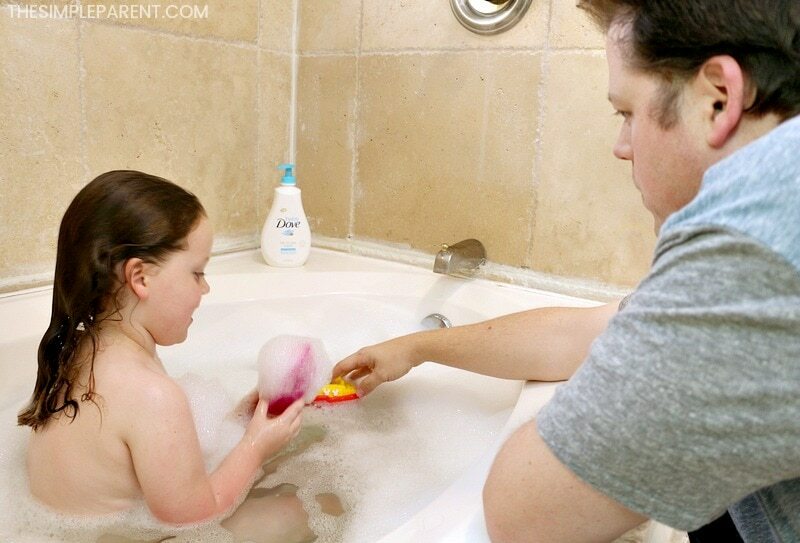 We did a learn a few things about bath time that have made things a lot easier with Carrigan. These five tips are the most important things for us to focus on to get a baby bath routine that worked for the entire family! My kids thrive on consistency. We’re pretty easygoing parents but there are a few things that we have to schedule and stay on schedule for. Bath time is one of those things. My kids like to know when they’re going to have a bath. That means they want to know exactly what days and at what times. So, while we do roll with the punches and take baths when they’re needed, my kids also know that on Sunday night they’re going to be in the bath tub. And yes, they’re going to have their hair washed. So I always suggest coming up with a bath time schedule and sharing it with your kids. You can even let them help plan it out for the week if that makes for a better routine! When it comes to a bath routine for babies and toddlers, preparation is key. I can remember being in the middle of bath time with Carrigan when she was tiny and not having a towel! You can’t just leave the baby in the bath alone (and I was home alone with her), so I got to use my shirt to dry her off enough to get a towel and finish the process. The mom in me was willing to be cold so she wouldn’t be! That’s what we do as parents, right? We always get prepared before the kids are in the bath. 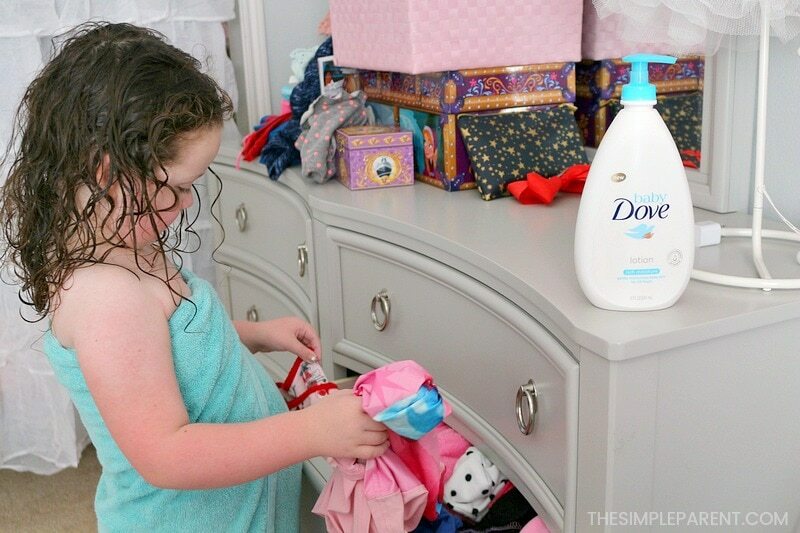 We make sure we have bath toys, towels (and extra towels), washcloths, something to rinse hair with, shampoo and body wash.
With Carrigan’s skin, we love using Baby Dove Tip to Toe Wash and Lotion. We started using it when she was younger because it helped her skin retain its natural moisture. It makes her skin so soft and I love the fresh scent! We have a consistent schedule for the days Carrigan takes a bath, but there is even a consistency to how Justin runs the bath time routine once she’s in the tub. They have a routine that they do in the same order every single time she takes a bath. It means that everything gets done and I never here much complaining about it. Plus, their bath time routine is also where I catch those magic moments I was talking about earlier. Every bath, they do the same thing in the same order. They add bubbles, Carrigan gets in and plays for a few minutes, then they wash her body, then her hair, and then she has more time to play before she gets out. Those stretches of play time are where they have some of the most amazing conversations! Justin has discovered just how important it is to make playtime part of the baby bath time routine. He figured it out when Carrigan was just a tiny baby. Back then, he would play peekaboo with her and read bath books with her. Sometimes he’d bring a little squirt toy. The giggles that would fill the room and the smile on his face are things that I will never forget. They’re moments that we’ll have forever. Now that she’s older, she plays a bit more independently but they will still use bath crayons together or play games with the squirt toys. It’s definitely a daddy-daughter bonding time. So it’s priceless. I also think that making sure there is some fun in the bath time routine is key to making it go more smoothly. Carrigan looks forward to taking a bath and getting to spend quality time with her dad. My favorite way to wrap up our baby bath routine has always been with lotion and a massage. When baths are right before bed, it’s a great way to help your baby relax and ease into sleep. Baby Dove is part of our bath routine at this step too. 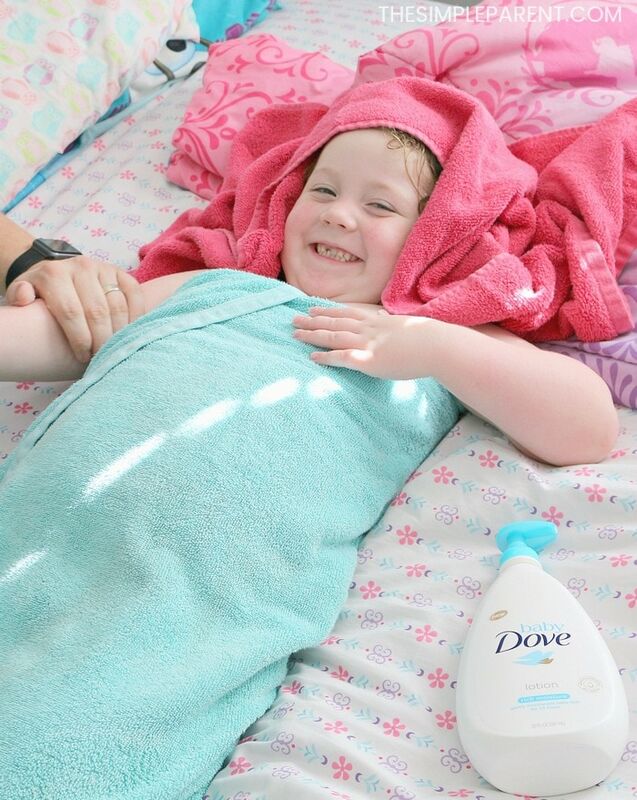 Baby Dove Lotion helps replenish Carrigan’s skin after her bath so that it’s always feeling so touchably soft. It makes me want to just snuggle and cuddle with her. 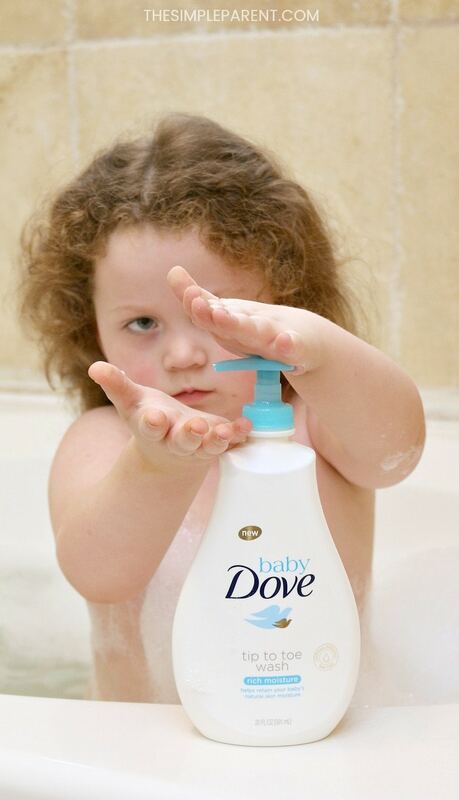 Baby Dove baby lotions are developed for baby’s delicate skin and I like knowing I can get her skin the extra special care it needs and deserves after ever bath! I love spending a few minutes putting lotion on her skin and massaging her body to help her relax. It’s a routine we’ve had since she was tiny and I cherish it. Once your baby is all lotioned up, putting on pajamas, and climbing in bed to share a story together is a great way to spend quality time together while making bedtime easier too! It has everyone around our house feeling relaxed and ready to rest! If you need another tip for helping your baby sleep better, check out our Aden and Anais sleep sack review! 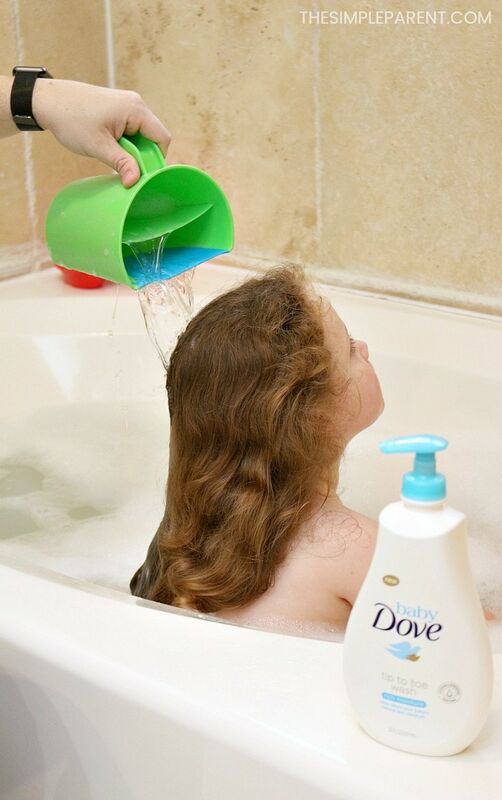 It’s a great way to follow your bath time routine straight into bedtime! Bath time is a great time to claim as bonding time with your babies. In the middle of our busy lives, it can feel like it’s hard to find time to slow down and really connect, so setting up a bath routine that works for your family is a good place to start! You can use your baby bath routine to start collecting your own special magic moment memories! Don’t be afraid to lean arouund the corner and listen to your partner with your kids. It’s an amazing thing sometimes! « Make an Easy Plastic Bottle Flower Vase for Someone You Love!